AjaxSwing is a web deployment platform for Java Swing applications. It allows companies that built Java desktop applications to run them as web applications. Another big step forward - AjaxSwing 4.4.1 available already! We never stop improving our product to bring you best experience. So, another release, AjaxSwing 4.4.1, is here! With this version, we polished performance on Red Hat Linux. A broader range of customization options are also available now, including start/stop of the service, operations with client-side content, special character usage and others. Finally, we have fixed a couple of issues with dialogue formatting and have optimized memory usage for better performance. You can find additional details in the Release History. We are happy to announce our new release 4.4.0 of our Java Swing to HTML conversion platform! It has bunch of important bug fixes and improvements, however, the main one is resolution of issue with focus management of concurrent sessions in a shared JVM. So, check the full list of the updates in our Release History section and make sure that your maintenance subscription is valid, so you can download the latest AjaxSwing version and try it right now! Writing UI tests for AjaxSwing has always been quite a challenge. We’ve gone through a dozen of third-party tools, but none of them worked for our UI testing needs. The conclusion? If you want to do it right, do it yourself! Here’s a story of how we used our automation testing tool Screenster to run visual regression testing for AjaxSwing, and how you can implement automation testing for your AjaxSwing applications too. 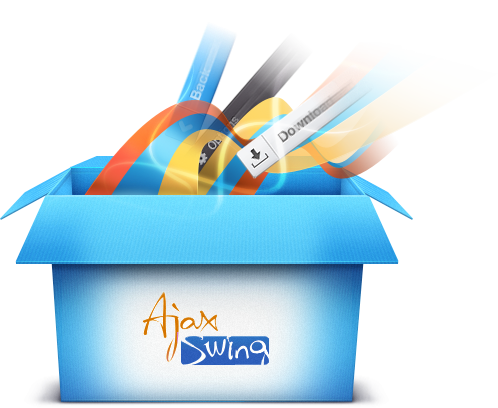 For better experience we've decided to move the AjaxSwing technical support from our forum to a Google Group. We will close the forum for posting, but you can still search all of its content. In case you need to ask a new question, please post it on our Google Group. AjaxSwing 4.3.3 is finally released! It was a major summer release, which included a bunch of fixes and lots of improvements. Conversion of custom elements gets easier now by enabling new templates, automated mechanism of rendering fonts and optimized performance of submenus. Meanwhile, we added CSRF protection to AjaxSwing, what makes is more secured than ever. To see the details about our latest release click here.